What elements make up a woman's film? Once dismissively tagged as 'chick flicks', A Woman's View: How Hollywood Spoke to Women 1930 - 1960, exposes Hollywood's hidden agenda during the golden era of American cinema. Spanning the pre-code decade of the 1930s, WWII 1940s period and the studio controlled 1950s, Basinger examines over 500 films in this pioneering work, to create a genre we now call “the woman's film”. A Woman's View deconstructs Hollywood's visual vocabulary in building the societal expectations to be imposed on women. The three decades of movies - almost exclusively created by males - instructed women on what their roles should be; but if one looked closely at the subterranean message, she might learn something else. She looks at the many facets and themes of the woman's world, weaving fashion, film, glamour and star power into a fascinating adventure that will leave the reader enriched, empowered - and proud to be a woman. ​- and write - about film history and women's studies in cinema. 1/2 Basinger, Jeanine. 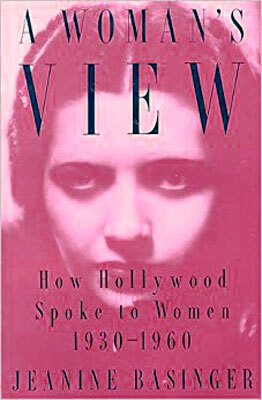 A Woman's View: How Hollywood Spoke to Women 1930 - 1960. Aug 32, 1993. Knopf Publishers. July 10, 2018.